We had purposely determined to wait for our second quarter commentary until after the debt debate in Washington had come to a final vote. As many of you know, we have been taking this opportunity to remind investors of our philosophy and investment style. In this market, then, it is timely that we discuss "oversold" stocks. As we write this note, the Russell 2000® Value Index has suffered its second largest three-day loss, in percentage terms, since late 2008. The index is down 15.2% during this period. Since the end of April, the Russell 2000® Value is down 23.8%. These movements, precipitated by a weak PMI reading and weak GDP revisions, have caused the market to reprice assets up and down the capital structure. The result is now termed "risk-off" on Wall Street, but really, it's the same old thing – fear and uncertainty. When that happens, investors move up the priority ladder of the capital structure in choosing where to deploy. The most senior debt to be found is US Government treasuries, which were downgraded by S&P. Upon news of the downgrade, treasury prices went up – way up. The real damage has been done to the equity markets in the US, where a cascading effect of slower growth, overall pessimism, and the languishing job markets have crowded out any risk-taking enthusiasm. There will be considerable analysis done of this market correction, but suffice it to say that the last three months have introduced enough uncertainty that investors have shortened their horizons. Below is a chart that you will no doubt see presented in various forms in the coming months. 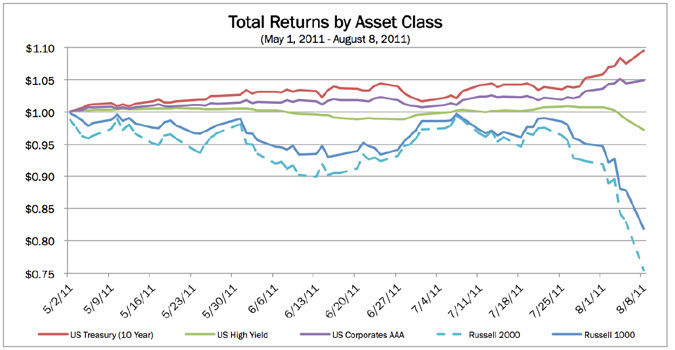 It is the total return of the broad debt and equity markets in the United States since the end of April. This is what risk retrenchment looks like. What are we doing in the current circumstances? What we always do. At Pacific Ridge, one of the attributes that we often run across in market cycles like this is the "oversold" condition. Stocks in this category are characterized by a rapid price decline that puts the valuation of otherwise healthy companies in the bottom half of market averages. They are the proverbial babies thrown out in the bath water. In most cases, there is some event that triggers the sell-off, and therein is the focus of our work. Currently, two important things have caused the current sell-off, in our view: (1) GDP growth expectations have been reduced by more than half, and (2) the psychology of the market has been hurt. This has resulted in a major shift from equities to cash, or their perceived equivalents. In this flight to perceived certainty, invariably, some very good companies will see their valuations compressed. Our job is to sort through the data and determine which companies now merit further review. We are spending the majority of our time looking at companies within our portfolio that have suffered, as well as those companies on our research list that have now fallen to pricing levels that look attractive to us.